This tool calculates the basic geometric properties of a cube. Choose the known characteristic of the object and enter the appropriate value for it. The calculated results will have the same units as your input. Please use consistent units for any input. 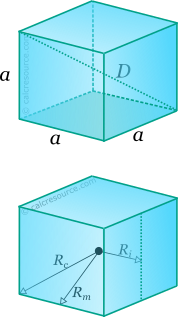 The cube is a common 3-dimensional object (solid). It has 6 faces, 12 edges and 8 vertices. By definition, cube is a hexahedron (solid with six faces) and indeed is the unique regular hexahedron, where by regular is meant that all faces are identicalregular polygons (squares for the cube). where a the length of its edges.